Romi Hill is a beloved lace designer, and we’re delighted to get the chance to learn from her in beautiful Lake Tahoe for our upcoming Interweave Escapes event! Romi was kind enough to sit down with us and chat about her inspiration for her patterns and life in the Sierra Nevada mountains. 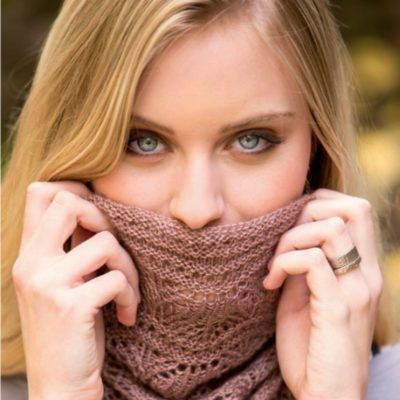 The Squall Line Shawl uses bottom-up construction to create a cozy triangular wrap. What was your main objective with your lace patterns? I am obsessed with the versatility of lace. People might think of it as frilly, but by changing the lace pattern, yarn used, and amount of lace in a piece, it can look elegant, sporty, or fashionable. In my book New Lace Knitting: Designs for Wide Open Spaces, I wanted to show the amazing range of possibilities. My music background led me to think of it as a theme with variations. I chose five traditional lace patterns that I really love, and my feeling was that, with different constructions, deconstructions, and weights of yarn, each lace pattern could support multiple designs that would hang together without looking repetitive. What kinds of yarns do you like best for lace knitting? I adore luxurious fiber blends in particular. Right now I am really deeply loving knitting with singles of different weights and blends. 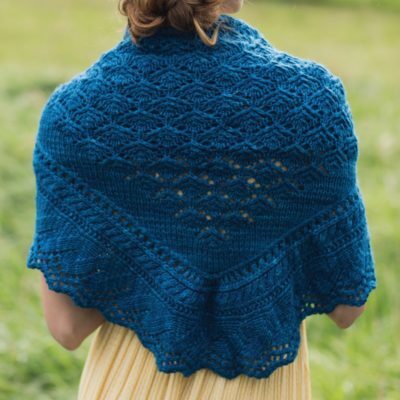 They block out so beautifully and keep that gorgeous open lacy look without bouncing back, even in a heavier aran-weight yarn. For lace, you have to be really careful in choosing a 100% wool yarn since wool has so much memory. It often just bounces back from being blocked. So I’m also crazy for fiber blends that combine silk, bamboo or Tencel with wool. It’s all about blocking the lace and having it stay blocked and pairing a fiber with no memory (and bonus! some lovely sheen) with springy wool that makes the finished project retain its lovely post-block shape. Made in a quiviut/silk blend, the Gentle Sky Cowl from New Lace Knitting is luxurious to both knit and wear. Tell us about the open spaces that inspire your work. We live in the high desert at about 5,500 feet on the eastern slope of the Sierra Nevada. The gorgeous scenery, air quality, and wide open spaces here free my mind to wander. And whenever I hit a snag figuring out details or get anxious about deadlines, I go outside, take a walk or a kayak to the local lake, and remember how small and insignificant my problems are when compared to the wide world around me. Perfect your lace knitting skills with Romi Hill on beautiful Lake Tahoe April 25–28! Which will be your knitting escape this year?